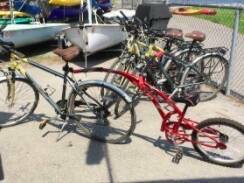 This bike attaches only to our Road Bikes, you may also bring your own bike and we can attach it for you. Explore the waterfront trail in Kingston or take the free ferry ride over to Wolfe Island and explore Big Sandy Bay beach. We can provide you with maps for both routes. Helmets and locks included in all rentals.